P's so fashionable... nice clothes !! Sina news: the stars He Rundong and Wang Haizhen appeared on the red- carpet( look at the second picture). 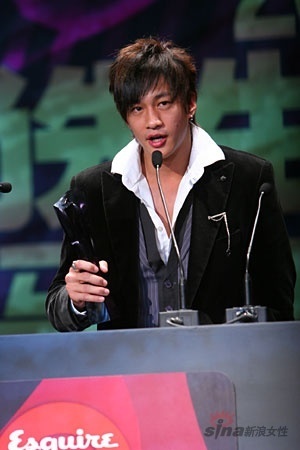 On January 23, 2008 The Fashionable Gentlemen Awards of 2007 created with great energy by the magazine Esquire and charmingly presented by Martell’s celebrities, was held in state in Beijing Exhibition Hall. While pursuing changes, The Fashionable Gentleman Awards of this year also followed its consistent principle to elect the candidates: success in career, outstanding talent and charm, elegant manner and uncommon appearance. The whole celebration was full of shining stars. Nearly 100 social celebrities and famous entertainers were present in rich clothes to witness this annual celebration of fashion industry. The famous entertainers He Rundong and Wang Haizhen appeared on the red-carpet. 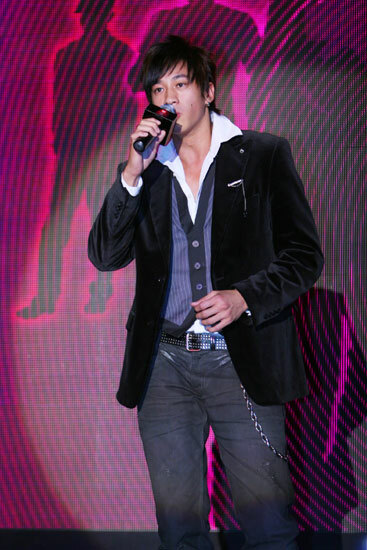 He Rundong won the 4th Fashion Entertainer Award and sang “ I only care about you”(look at the last picture). Hmmmm.......Peter sang WZZHN that nite.... I'd like to look for the clips. Hope someone upload it in baidu or tudou.